The Ardenne is the natural geographic massif that stretches from northern France into the Belgian Ardenne to the north and borders Luxembourg to the west. Just north of Reims, the department’s capital is Charleville-Mézières, a delightful medieval and Italian Renaissance town with a 17th-century square modeled on the Place des Vosges in Paris. The Ardenne refers to the whole area, taking in the three countries; Ardennes is the name of the French department, part of Grand Est or Alsace-Champagne-Ardenne-Lorraine region. Why Is It Less Well Known Than Champagne? Well, there’s one obvious answer to this; the Ardennes does not produce Champagne, nor wine. But it does have a well-deserved reputation for producing fabulous beer from its micro-breweries. What Else Is the Ardennes in France Known For? The Ardennes is France’s greenest department, with the valleys of the river Meuse and the Semoy far prettier than Champagne. Visitors come to hike along the well-marked paths through green forests and beside the gently meandering rivers, or around the medieval fortified manor houses, churches, and towns. 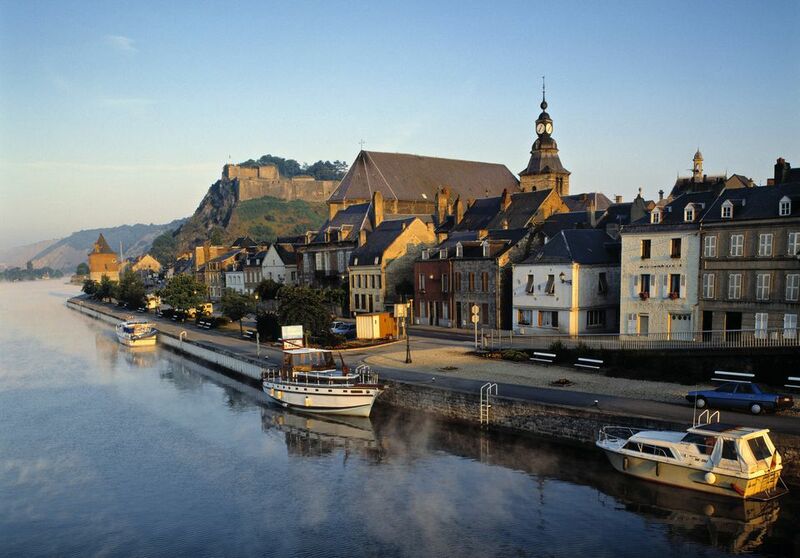 Others take to their bicycles, particularly for the Trans-Ardennes route – 83 kilometers (51 miles) of gentle cycling along the banks of the Meuse from Montcy-Notre-Dame in the south to Givet in the north. It is also the area of France that has seen bitter fighting through the centuries. The Franco-Prussian war lasted from 1870 to 1871 and resulted in France losing Alsace and half of Lorraine, including Metz. In World War I, Germany invaded the French Ardennes on August 21st, 1914, occupying the whole department throughout the war. Start at Charleville-Mézières, the capital of the Ardenne department. It’s a small, pretty town with the glorious Place Ducale, built in the early 17th-century and surrounded by arcades where you can sit on an outdoor terrace and admire the view. From May to October, weekend events fill the square, from beer to music festivals. Charleville-Mézières is a major puppet city, with an institute that teaches the art to an international audience. Every two years the biggest and most important puppet festival in the world fills the whole town. There’s an official selection of over 150 different puppet companies from major countries who perform in different venues. Unofficial puppeteers perform in the streets and the main square, turning the city into an extraordinary theatre of the art of marionettes. If you’re here at other times, see an exhibition at the Institut de la Marionnette on place Winston Churchill. Or just stand outside the huge corner clock next to the Institut when the clock strikes the hour, the doors under the giant face open and the local legend of the 4 sons of Aymon is told – in 12 separate episodes from 9 am to 10 pm. Or go on a Saturday for the 9 am complete performance of `the story lasting half an hour. If you want to see the inside workings of the giant puppet show, visit the excellent Musée de l’Ardenne. It’s housed in old and striking contemporary exhibition spaces and covers everything a local museum should with objects from the earliest times, through room settings, models of the town in the 17th century, and 19th-century paintings. And of course, those puppets which, far from the lovable modern varieties, look strangely sinister. The town’s other great claim to fame is the poet Arthur Rimbaud (1854-1891) who was born here (though he did try to run away several times in his youth). For more on his life, visit the Musée Arthur Rimbaud, housed in a beautiful stone water mill at the end of a street that forms part of the Place Ducale design. Rimbaud produced his famous works in just 5 years and the museum gives you a brief foray into his life, his affair with Verlaine and his time in Africa. He died of gangrene in a Marseille hospital at the age of 37 and is buried in the local cemetery on avenue Charles Boutet. There’s a postbox here, which fills up with letters from fans as far away as Japan. Mézières was originally a medieval city, joining with Charleville in 1966. Its most significant, and unusual attraction, is the Basilica of Notre Dame (10 Place de la Basilique), begun in 1499 but damaged in the wars. After World War II, it was decided to fill the destroyed stained glass windows with modern versions. René Dürrbach, a painter, and sculptor, and friend of Picasso started in 1954 and completed the 66 windows in 1979. The result is extraordinary; a glorious abstract set of windows that are full of symbolism. Be sure to pick up the leaflet in the church to identify the colors in the windows: Earth is yellow; Fire is red; water blue and air white as well as the other symbolic shapes. If you're coming from the UK, take the train from St. Pancras International to either Reims or from the TGV station Champagne Ardenne. Hire a car in Reims or take the train from Reims to Charleville-Mézière which takes from 50 minutes and costs from 9.20 euros. Fares from London to Reims start at £90 standard class return per person and the journey takes 4 hours 13 minutes. The TGV goes 3 times a day from Gare de l’Est in Paris to Charleville-Mézières taking 1 hour 40 mins. There are more daily trains from Gare de l’Est changing at Reims taking from 1 hour 48 mins or changing at Champagne-Ardennes TGV station and Reims taking from 2 hours 8 mins. There are also good trains from Lille (from 2 hours); Brussels (1 hr 22 mins) and Amsterdam (3 hrs 20 mins). The gare sncf is on avenue du Général Leclerc, a 10-minute walk to Place Ducale. If you like funky, fun hotels you must stay at Le Dormeur du Val, named after one of Rimbaud's poems. Located in a former warehouse with the definitely different decor, it's a comfortable, well designed 4-star hotel with all the conveniences of a modern hotel. There's no restaurant (but you do get breakfast), but it's just a 10-minute stroll from the Place Ducale. For more hotels, read guest reviews, compare prices and book a hotel in Charleville-Mézières with TripAdvisor. Try the delightful Sel et Poivre at 12 Avenue Forest, 00 33 (0)3 24 55 71 16 (no website), particularly if you're staying at Le Dormeur du Val as it's just behind the hotel. In the center of town, your best bet is the informal but chic La Table d'Arthur, 9 rue Bérégovoy. The ground floor has seating around the bar on high stools and tables around the sides of the restaurant; downstairs there's a more conventional restaurant. Menus start at 22 euros and the cooking is an excellent modern take on classic dishes. Sedan is just 25 minutes by car from Charleville-Mézières to the south-east. On the Trans-Ardennes walking route, its fame comes from having the largest castle in Europe at its heart. The Château Fort is a massive structure, with ramparts and towers that look out over the town below. Inside you see model soldiers (check out the long shoes – apparently the longer the toe, the wealthier the wearer); room settings, a vast model of the castle and surroundings, and weapons. Au Roy de la Biere at 19 Place de la Halle is a must if you like beer and good pubs. Try their selection, particularly the Passe Stout Maison which could become 'Passed out' if said – and drunk – quickly enough. Best of all, spend the night at the Sedan Castle Hotel, Hotel Le Château Fort where comfortable rooms start at 90 euros a night. Eat in the hotel's La Tour d’Auvergne restaurant. If château hotels are your thing, book a palatial room at the Domaine Châteaufaucon in Donchery, just 25 minutes from Sedan. Magnificent grounds, a roaring fire in one of the dining rooms and a small spa make up the package. You get a sense of what she meant at Monthermé. Follow the signs for the major footpath, park the car and walk up a small hill. On one of the several viewpoints, you look down onto the Meuse that forms a perfect U-shape. It’s part of the famous Trans-Ardennes cycle route. In complete contrast, visit the industrial Musée de la Métallurgie Ardennaise (Museum of Ardennes Metallurgy) for the story of the industrial past. Built-in 1880 by an engineer, this was the place for the manufacture of nuts, bolts, rivets, and metal fittings until it closed in 1968, a victim of the new world order. It makes an interesting visit, taking you from the early days when the machines were operated by small dogs on a treadmill and the workforce employed children as young as ten years old, to today when the most industrial design is done on 3-D printers. There’s an excellent short film of workers talking about the factory and how it was such a part of their lives. It’s at Bogny-sur-Meuse on the banks of the river just north of Charleville-Mézières. Sausage and cured hams are some of the specialty foods of the Ardennes and there's no better place to see a full range, and buy boudin blanc (delicious white sausages - don't be put off) and top ham cured over a year than at Aux Saveurs d'Ardennes at La Francheville on the outskirts of Charleville-Mézières. If you're driving from Charleville-Mézières to Reims, take time out at the Ardwen brewery in Launois-sur-Vence. It's one of the successful microbreweries in the region, producing 300,000 liters a year of the delicious golden nectar. They take their brews seriously. Try the Woinic Worksheet Triple with a nose described as: "Well marked grains and a myriad of flavors around the notion of floral and especially wildflowers, spicy flowers, and all flowers honey." This is the place to stock up on very well priced top brews, and have lunch. 13 euros gets you 3 courses and a glass of beer or wine. Launois-sur-Vence was a major staging post on the route from Paris to Mézières and Sedan (Charleville was still a small town in those days). Built in 1654, a vast gateway (Porte de Paris) leads you into an extensive yard. Here you're faced with a barn and stables along one side with a second door (Porte de Mézières) for the refreshed horses and 'Diligence' (a large closed French stagecoach) to continue their journey. The present owner also has horses - the Ardennes variety that drew the 'Diligence' and he is breeding these strong relatively small horses whose numbers have dwindled. In the barn, there might well be a fair such as the antiques fair on the second Sunday of the month, or local producers selling honey and cakes. Just one more of the surprises that await you in the Ardennes.